Hookworm Persists In U.S. Despite Belief That It Was Wiped Out Decades Ago : Goats and Soda The American medical establishment was confident: no hookworm disease in the country for decades. A new study uncovered cases in Alabama. Hookworm was a fact of American life a century ago. In this photo, circa 1912, from Faulkner County, Arkansas, resident gather outside a "dispensary" for free treatment. The U.S. thought it wiped out hookworm decades ago. But a new study shows that it never truly went away. Hookworm thrives in regions of extreme poverty with poor sanitation and affects some 740 million people worldwide. Developing nations with warm, moist climates, in regions like South America, South Asia and Southeast Asia, are most susceptible to the worm. Hookworm primarily spreads when an infected person defecates outside, leaving behind stool contaminated with hookworm eggs. Once the eggs hatch, the soil becomes infested with worms, which can latch on to the bare feet of anyone walking by. The microscopic worms burrow into the body through a hair follicle and ultimately worm their way into the small intestine to feed on blood. One form of hookworm can be ingested via contaminated soil or food. 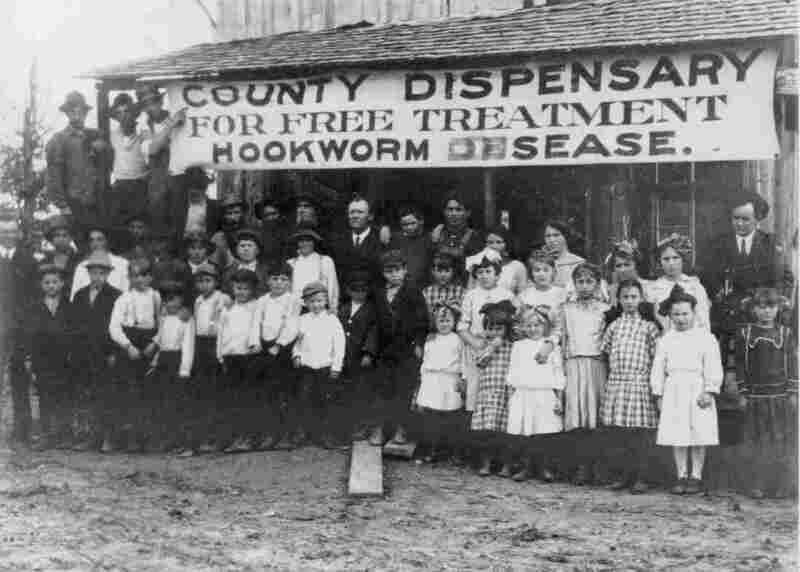 Hookworm was rampant in the U.S. more than 100 years ago. It thrived in the poor south, where many families could not afford proper outhouses and sewer systems were rare. Thanks to widespread treatment efforts, education and economic development, the parasitic worm was eradicated in the U.S. although the exact date isn't clear — somewhere between the 1950s and the 1980s. Hookworm was now just a problem of the developing world — or so we thought. Now, a new study has uncovered a community of people infected with hookworm in Alabama. The study, published this month, found that 19 of 55 individuals tested positive for the worm. "I was very surprised by this," says Dr. David Diemert, a hookworm expert at George Washington University. "There has not been any documentation of people being infected in the U.S. for the past couples of decades; we thought there was no more local transmission in the U.S."
Lowndes County, Alabama, is one of the poorest counties in the U.S. — so poor that many residents lack proper sewage systems. Unable to afford a septic system, residents concoct their own sewer line using PVC piping, the researchers observed. The pipe runs from the toilets in their homes and stretches off some 30 feet above ground until it reaches a small ditch. "This seems safe to [the residents]," says Dr. Rojelio Mejia, a pediatrician and infectious disease specialist at the Baylor College of Medicine who led the hookworm study. "But Alabama is very hilly and any drizzle of rain causes flooding, so whatever they delivered to the site spreads to the entire area, including their neighbors' area." The soil in the area, Mejia adds, also drains poorly, worsening the situation. When the trenches overflow, the soil becomes contaminated with waste. Anyone walking outside barefoot, or even with bare ankles, risks hookworm infection — that's because the worms are expert at latching on to passers-by. 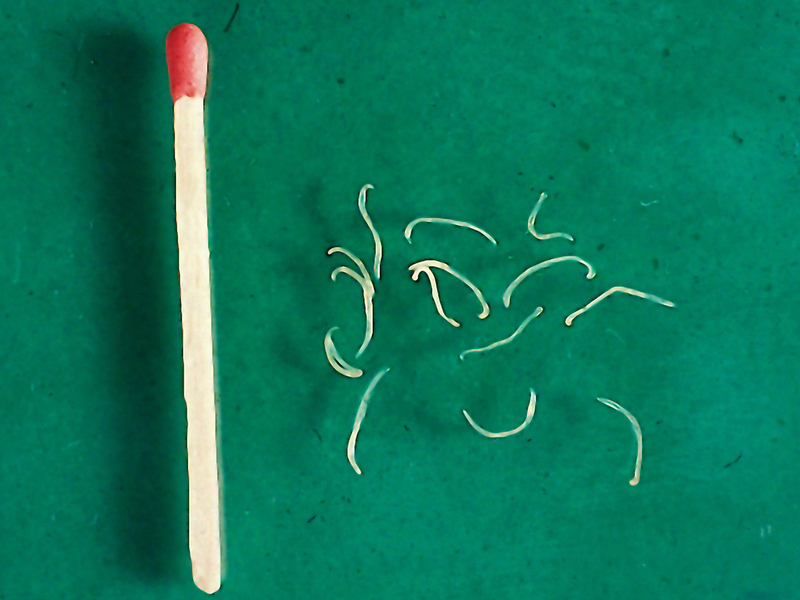 Adult hookworms, from a dog. The larva, which penetrate the skin, are even smaller. What's worse, even homes can become contaminated. Nearly three quarters of study participants reported that at one point or another, raw sewage had made its way back into their house. Flooding often carries sewage to their doorways, Mejia says, and drainage pipes can become overwhelmed with rain, flushing waste back into the home. Concerned about the sanitation situation and its potential health implications, the Alabama Center for Rural Enterprise — a nonprofit organization that helps address poverty in the state — approached Mejia's team. Mejia's colleagues had previously reported that poor U.S. communities with poor sanitation were at risk for "neglected tropical diseases, which we ordinarily think of as confined to developing countries." Mejia's team tested for multiple parasites prevalent in the tropics, including hookworm. Stool samples revealed that community members had one or two hookworm eggs per gram of stool. That differs from what researchers see in other countries where hookworm is a problem. The reason is likely that there are more hookworms infesting the soil in poorer countries, perhaps because of high rates of open defecation. So people may be exposed to hookworm more often. "Hookworm does not replicate inside of you; they don't mate inside of you and have baby worms," Diemert explains. "The only way to increase the number of worms in your gut is to be exposed to more larvae outside." Diemert hypothesizes that residents of the Alabama community are only periodically exposed to worms. But in other countries and regions with no plumbing, Diemert says those who walk outside barefoot can be exposed to worms on a daily basis. More exposure means a higher likelihood of complications. According to Mejia, one worm sips just a half a drop of blood a day. But if you had 100 worms inside of you, that becomes six teaspoons of blood a day. One thousand worms can gorge on 60 teaspoons — more than a whole cup of blood. That's why people in other countries often become anemic and protein deficient, and in children, growth may be hampered. Hallmark signs of infection are itching and rash where the worm first burrows into the skin. Later, individuals may experience stomach pain, diarrhea, loss of appetite and excessive fatigue. With severe enough blood loss, people can die. Treatment, however, is easy. One dose of albendazole — two 200mg pills — can clear the worms out. But as we've learned in other countries, treatment is only a temporary fix. "We can't prevent people from getting re-infected until they deal with their sewage problem," Diemert says. "You can give as much education as you want, but if they still have flooding and no resources for proper plumbing, you can't do much to stop it from happening again." Fixing the problem is next to impossible for much of the community, according to the research team. The average income in Lowndes County is $18,036 and a septic system for a single home would cost about $15,000. "In my study, we have a very poor, disenfranchised population here that is being neglected," Mejia says. "Everybody was African American and living below the poverty line." Diemert and others are working on a vaccine for hookworm but it is years away from fruition, he says. Until then, unless sewage problems are dealt with — both here and abroad — hookworm will never truly be eliminated. Nadia Whitehead is a freelance journalist and a science writer at Texas Tech University Health Sciences Center El Paso. Her work has appeared in Science, The Washington Post and NPR. Find her on Twitter @NadiaMacias.